Sturmtiger (German: "Assault Tiger") was a World War II German assault gun built on the Tiger I chassis and armed with a 380mm rocket-propelled round. The official German designation was Sturmmörserwagen 606/4 mit 38 cm RW 61. Its primary task was to provide heavy fire support for infantry units fighting in urban areas. The few vehicles produced fought in the Warsaw Uprising, the Battle of the Bulge and the Battle of the Reichswald. The fighting vehicle is also known under a large number of informal names, among which the Sturmtiger became the most popular. There are two complete Sturmtiger's in existence. One is in Russia and the other, which used to be at Aberdeen Proving Grounds, was sold to a museum in Germany. This kit is fairly recent, having been released in 2017. Not surprisingly, it uses a considerable number of sprues from the standard Tiger I, one of Tamiya's earliest 1/48 armor releases. However, pretty much everything from the chassis upwards is new to this kit. Having a weighted chassis has become a staple of these kits, though I'm not sure why that is the case. In this case, you have four fairly large metal rods that fit into housings provided for the chassis. Road wheels are then attached. The idler and sprocket have polycaps to allow them to be rotated to make it easier to attach the tracks. Tracks in this case are link and length, which allows for a fairly quick assembly. Once that is done, the upper fighting compartment and gun barrel are dealt with. The barrel is held in place with polycaps as well so that it can be elevated. Since the area where the breech is located is hidden inside the crew compartment, no detail inside is provided. When most of the upper area is done, then it is attached to the lower hull and the various ancillary bits like fenders, pioneer tools, exhaust section, and the crane used to hoist the shells is finished. A standing figure is also provided to add some scale to the finished product. Instructions are standard Tamiya 'road map' type that provide well drawn construction sequences and some color information using Tamiya paint numbers. A separate markings sheet provides the camouflage pattern that matches the box art tank. For those hoping to find the hull parts with zimmerit molded in place, be prepared to be disappointed as that has not been done. I am sure that this kit will be as well received as the others in this line. 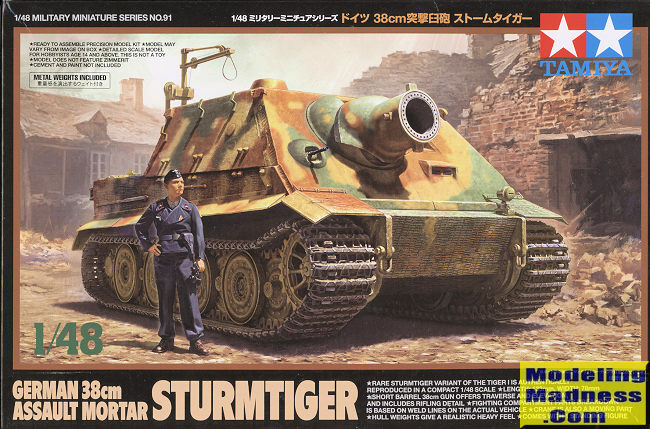 The Sturmtiger is an impressive vehicle in its own right and will be a nice build for those who like this scale.